The purpose of the National Pollutant Discharge Elimination System (NPDES) permit program is to control water pollution by regulating sources of pollutants that are discharged into our waterways. Construction site runoff can be one of the largest point sources for pollutants and as such, NPDES permit holders are required to address this potential source of pollution. In support of the permit requirements, the City of Clayton adopted Ordnance 5965 to address stormwater pollutants from construction sites. The ordinance was implemented as Section 430 of the City’s Municipal Code, which details the plan preparation requirements for sites that disturb 1 acre or greater and sites that disturb more than 5,000 square feet but less than 1 acre. 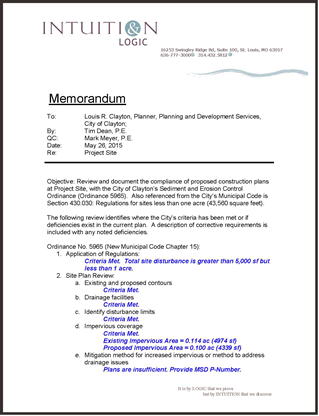 The ordinance identifies site plan development and construction implementation requirements for proposed construction projects. Each proposed project meeting the disturbance criteria must prepare a Storm Water Pollution Prevention Plan (SWPPP) for the contractor’s use during construction to ensure proper implementation of erosion and sediment control measures. The City of Clayton retained Intuition & Logic to perform SWPPP compliance reviews for development projects submitted to the City to confirm the plans were in agreement with the ordinance requirements prior to issuing land disturbance permits. To date Intuition & Logic has completed over 100 plan reviews for the city.